Available Color: White, Black, Grey, Brown, Green, Yellow, Beige, Red, etc. We offer a wide range of Decorative Figure that exquisite in bronze media statues. These are widely used for decoration purpose. We have a team of highly experienced professionals who work in close coordination with clients to meet their specific requirement. Furthermore our esteemed clients can avail our range at reasonable prices. We have for our clients our Soapstone Undercut Animals Sculpture . We are manufactured from qualitative range of raw material. These Soapstone Undercut Animals Sculpture are offered in variety of design, shape, size and colour. Our assortment of product are available at most competitive price. We are passionately engaged in manufacturing an exclusive array of Marble Dog Figure Set. - Size :Min. 12 Inch to 150 Inch. 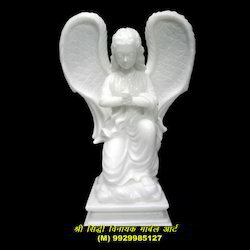 We are a well-renowned organization in the industry to provide our patrons the best quality array of Marble Angel. - Institutes, Schools, Roads, etc. 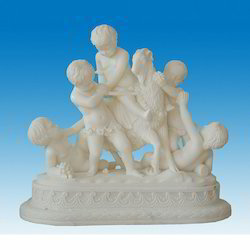 We hold expertise in crafting of a Lady Figure Statue, which is designed using marble. The marble used for carving this range is tested prior the use to ensure its quality. Our range is best suited for decoration purposes and adds an artistic touch to the décor. Clients acclaim this range for its finishing, durability and long-lasting sheen. Our urge to reach the top has enabled us to craft the enticing range of Marble Busts, which is fabricated using optimum quality marble. These statues are designed by our artisans using the roman style that in turn makes it a preferred choice of our clients in the national as well as international market.